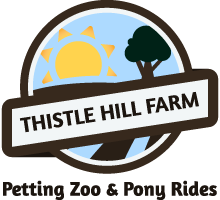 Established in 1994, Thistle Hill Farm Petting Zoo & Pony Rides is a mobile petting zoo and live pony ride carousel available for corporate and private events throughout Edmonton and the surrounding area. Licensed and insured, we feature experienced operators and clean animals in one of Edmonton’s oldest licensed petting zoos guaranteed to entertain your guests with memories that will last a lifetime. From registered miniature Nigerian dwarf dairy goats to fancy poultry, rabbits and commercial Dorper cross sheep, our petting zoo has a large assortment of exotic, commercial and seasonal animals available for school educational programs, fairs, BBQs, birthdays and holiday parties. A hands-on attraction suitable for all ages, our mobile petting zoo is adult and child-friendly. Customizable to suit your specific needs, our program is also a highly interactive way of introducing children to friendly animals of all types. To book our services for your next special event or to obtain an estimate, please give us a call today at 780-878-3344! Hours: Call today to schedule an appointment.